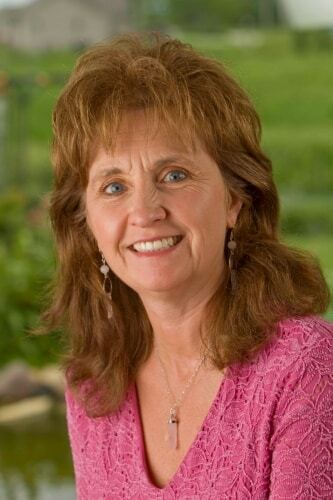 Bonnie Groessl, MSN is an international podcast host, best-selling author, success coach and holistic nurse practitioner. Bonnie has additional training in integrative medicine, hypnosis, mind-body techniques and energy work. A graduate of Brendon Burchard’s Experts Academy, she also has extensive training in creating virtual businesses and internet marketing. Bonnie is passionate about helping entrepreneurs share their message and build an online presence so they can attract more ideal clients and make the money they deserve. Bonnie is active in public speaking, webinars, master classes and workshops for professionals and the public. She lives in Green Bay, Wisconsin, with her husband, Mike Dauplaise. Together they own M&B Global Solutions Inc., offering business growth and boutique publishing services. I have worked in nursing since 1976 and have been a nurse practitioner since 1995. As an RN, I have had many roles including staff nursing, home health care and administration. My administrative experience covers more than 30 years in health care and business development. After treating patients as a nurse practitioner in a primary care setting (internal medicine), my practice shifted after about 5 years toward headache and chronic pain management. I moved to the department of neurology in a large multi-specialty clinic and developed the headache clinic there. My specialty soon became dealing with pain in general, both physical and emotional. Over the years, I had seen how traditional medicine outcomes could be enhanced by therapies that may be considered non-traditional or complementary. I also learned how nutrition, our minds and our body’s energy can influence our own healing abilities and general well-being. My interests led me to pursue additional education and training in several integrative medicine modalities, including nutritional medicine, mind-body techniques, hypnosis and energy medicine. In 2005, I went into private practice so I could focus more on the complementary techniques and spend more time with my clients than I could in a large clinic setting. I enjoyed a busy practice and have been active in teaching classes as well. I learned so much along the way and grew my private practice to six figures in less than two years. An experience in 2007 opened my eyes to the ability I have to reach the world. 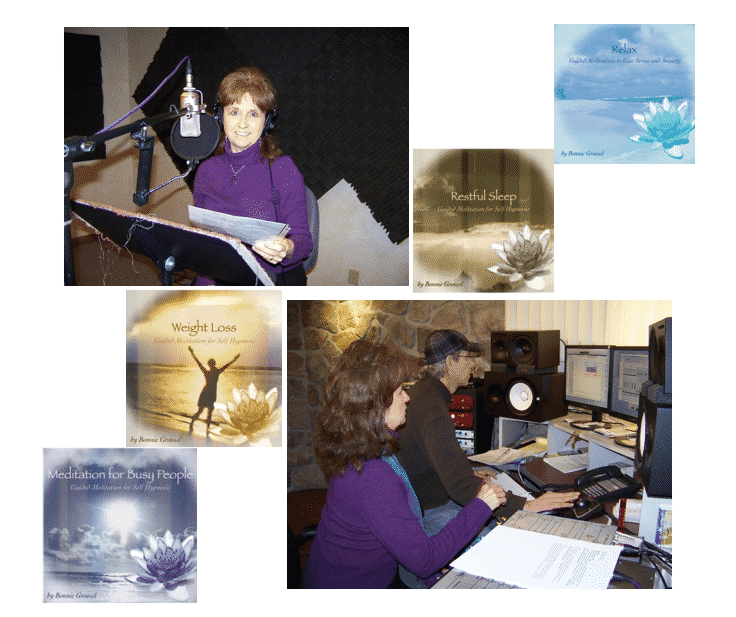 I recorded a series of 4 guided meditation CDs at a local studio. I then sent them to be manufactured, and the company contacted me to ask if I wanted the “web package” for $49.95. I didn’t know what it was, but said yes. I later realized that the “web package” involved the creation of digital downloads of my recordings. They spread them all over the world. Every Tuesday, I get royalties from sales of the physical CDs and digital downloads from all over the globe and feel good that I am reaching people everywhere. In 2009, I had the opportunity to reinvent myself again. 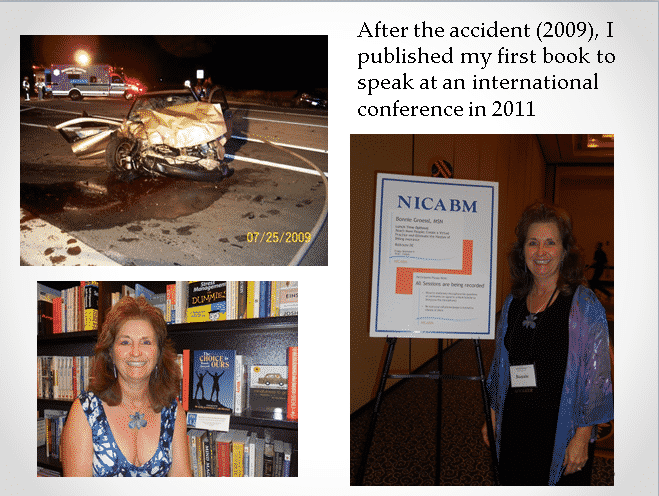 I was in a serious car accident and suffered a severe traumatic brain injury that left me in a coma. I needed to relearn how to walk, feed myself and think clearly again. With lots of therapy, good self-care, prayers and my belief that I would get my brain back, I went back to my practice in a relatively short time. Armed with great appreciation of my journey and recovery, I wanted to reach more people with the message of believing in yourself. I want others to dream big and feel self-empowerment. Everyone can have, do or be anything they want in this life. Sometimes limiting beliefs can hold us back from the life we deserve. I set out on a mission to learn everything I could about becoming an expert, building credibility, developing a virtual practice, creating products and services and of course working on my mindset for success. It has been a journey and I am so grateful for all the things I have learned from mentors, coaches, teachers and many classes along the way. I know it’s my soul purpose to help people reach their dreams faster by overcoming limiting beliefs, building a success mindset and shortening their learning curve. It’s what makes my heart sing.